There was a time when companies involved in bulk bag manufacturing set their own product standards. Our vision has never changed, though our product lines have. 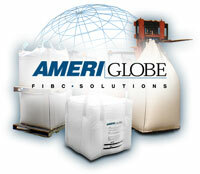 We have expanded to meet an ever-growing list of new challenges from AmeriGlobe customers: meeting those challenges with new bulk bag designs and new products and services, such as our offshore partnerships that transcend those companies who are satisfied to manufacture stock solutions to what they sense their customers can accept. Our customers know that "industry standards" don't always measure up to theirs. AmeriGlobe's customers continue to expect more from us. They know they can count on AmeriGlobe to innovate, create, craft and deliver, all the while maintaining focus on their needs. Our customers know we understand the definition of "responsiveness" and "individual attention." Every day we open our doors is a day we commit to being the company we set out to be. And we know we get there by meeting and exceeding the expectations of others.